A pleasant little pub on the edge of the village of Chaldon, just inside the M25, an inn is documented on the same spot as The Harrow since at least the 16th century, and it sits just a few yards from the Pilgrim’s Way on the ridge of the North Downs. 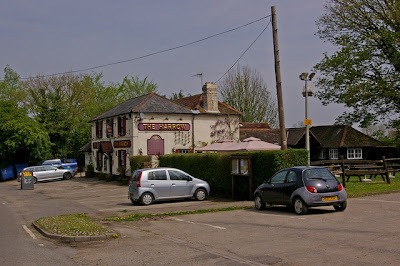 It occupies a beautiful spot, surrounded by woodland and on the top of a hill which makes it the second highest pub in Surrey. It is also just off the North Downs Way, a popular long distance trail, meaning it is popular with walkers. When your author dropped in yesterday it was busy with locals and visitors, and the food was good, with a faint hint of woodsmoke in the main bar and the spots of rain outside making it feel rather more like spring than summer.